Heat 1 tbsp ghee in a non-stick or thick-bottomed pan over medium heat and fry grated carrots for 2 min. Add milk, mix well and cook carrots, stirring frequently until all the milk has evaporated. Add sugar, mix well and continue stirring frequently until the mixture thickens. Remove from heat. Add cardamom and stir well. 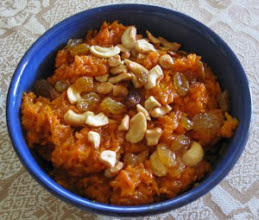 Heat ½ tbsp ghee on medium heat, add cashew nuts, stir till lightly browned, and add to carrot mixture. Repeat with raisins.